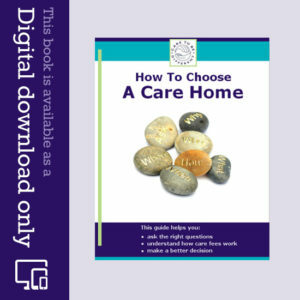 Already in a care home? This timeline shows the dates and stages of the case I pursued on behalf of my father to secure NHS Continuing Healthcare funding. Read a short summary of his health needs first. This battle took nearly two years. It was slightly easier than the one for my mother, because, as time passed, I’d learned how the UK care system worked. I also new that all my letters and arguments had worked, too. Everyone’s situation is different, but winning this case for Dad showed me that my own experience and practical know-how could now help others in a similar situation. June 05: My father went into a nursing home for full-time care. At the time his fees were £500/week. Social Services gave me some forms asking about Dad’s financial situation. I knew Dad would hate the thought of me divulging his personal financial data. I knew he had some savings and, like many people, I simply assumed he’d have to pay for care, so I didn’t send back the forms. 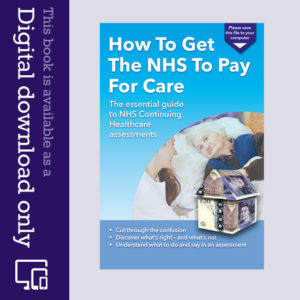 Aug 05: The NHS assessed Dad as needing the low-rate band Registered Nursing Care Contribution (RNCC), which covered just a fraction of his Care Fees. (Today there is only one band for this.) I didn’t know anything about this at the time, and I’d not been informed about any care assessments, nor indeed any need for an assessment. After three months he was supposed to have another review. This did not happen. There was also no care assessment at all for NHS Continuing Healthcare. Apr 06: The NHS confirmed that Dad would continue to receive RNCC at the low rate. There was still no assessment for NHS Continuing Healthcare. At this stage I was just beginning to read more about NHS funding and the way that elderly people are denied the care funding they’re entitled to. Jan 07: My father deteriorated hugely in terms of his mental health. In many ways I felt he was no longer the father I’d known. Apr 07: I spoke to the care home GP about an anti-psychotic drug I discovered my father was being given. I was very conerned about it and his deterioration had coincided with him taking it. The GP said she’d take him off the drugs, but I later found out Dad was still being given them. Aug 07: Dad’s nursing needs were increasing, but still no one had done a proper assessment for NHS Continuing Healthcare. I wrote to the NHS asking for one – and asking why this had not been done before. Aug 07: The NHS confirmed Dad had ‘erroneously’ been assessed for RNCC instead of NHS Continuing Healthcare. They said that the lack of care assessments had been an ‘oversight’ and ‘lack of resource’. Sep 07: My father was assessed for NHS Continuing Healthcare. The assessor put considerable pressure on me to sign her notes afterwards. I refused – and I wrote on the notes that I had simply attended the care assesment and was not agreeing to any subsequent interpretation of those notes by the NHS. I received no communication or paperwork from the NHS for two months. Oct 07: The UK government introduced the new ‘National Framework for NHS Continuing Healthcare’ in England. In theory, this was supposed to introduce a single care needs assessment procedure for all PCTs to follow, to end the postcode lottery for care fees funding. In practice it still left room for assessors to apply their own subjective ‘interpretation’ and opinion to the eligibility criteria. Nov 07: I wrote to the NHS to chase the result of Dad’s previous assessment. Nov 07: A PCT review panel met to consider the nature, complexity, intensity and unpredictability of Dad’s health needs. Dec 07: The panel decided he was ‘ineligible’ for NHS Continuing Healthcare. However, no mental health nurse had been involved in the assessment and yet this is supposed to happen. The assessment result clearly stated that my father had more ‘health’ needs than ‘social’ needs – and yet he was still found ineligible. I realised that everything seemed to be skewed to show that, because Dad’s care was in a care home and not in hospital, his needs were defined as ‘social needs’ in terms of funding, when in fact they were health needs. His healthcare needs were about the damage to his brain from his various illnesses and (in my personal view) also from medication. Spring 08: I received several bills from Dad’s local council totalling thousands of pounds. The bills said they were for care, however Dad did not owe any money to the Council. I queried the bills and the Council agreed they were incorrect and that they would issue a credit note. No such paperwork was ever forthcoming. Given the cost of care, many people might have simply paid such bills, believing that they were correct. Although this was an administration error, it served to further reinforce to me what a mess the care system in the UK seems to be in. Mar 08: I wrote to challenge the ‘ineligible’ decision and to claim a refund of all care fees Dad had paid since Jan 07. Jan 07 was the date from which I believe he had the best chance of being refunded. In hindsight I should have claimed from the very first day he went into care. Apr 08: I wrote again. Dad was becoming increasingly ill.
Apr 08: I received a reply from the NHS countering some of my points. The NHS suggested yet another care assessment and yet another PCT Review Panel, this time involving a mental health nurse. May 08: I wrote to the NHS again, countering further argument they had presented, and I requested an assessment on a weekend, because of the increasing cost to me of taking time out of work. I was self-employed. June 08: I received a letter to say the assessment could only be on a weekday. It had taken a whole month for the NHS to tell me that! Late spring 08: Dad had been having various tests and scans for worsening urology problems. 2 Jul 08: Another assessment (a ‘needs portrayal’ using the Decision Support Tool) was done. It’s not unusual for the main input into an assessment to come from just one nurse or carer from the care home (who may not actually know the patient very well at all). It means the assessment may be based on second hand information from a hastily-kept care plan at the care home, and it is evaluated by NHS people who also don’t know the person being assessed. The ‘Chinese whisper’ effect leads to inaccuracies in information and incorrect decisions being made – right from the outset. July 08: My father was told he had terminal kidney cancer. Dad seemed to fall into a black hole as far as the NHS was concerned. There was no communication at all from the hospital about his cancer. I rang the consultant’s department frequently, but the phone was never even answered. The care home had no information from the hospital either. No one seemed proactive or bothered at all in helping my father deal with the shock of the diagnosis or looking at what lay ahead in terms of what the cancer meant, how it would develop, what that would mean for him towards the end and how long it would take. Nothing. If my father had been at home or in hospital with such a diagnosis, the NHS would have had to act. Instead, he seemed to have been wiped off the map because, a) he was in a care home, b) he was old. The local hospice made contact, though, and that was the first time I felt anyone at all was willing to help. One of the hospice nurses spoke to a GP on my behalf, asking the GP to recommend NHS Continuing Healthcare. End Aug 08: I wrote a very angry letter to the hospital, but I didn’t send it in the end. I was losing the will. I couldn’t believe that, even now, I was still having to fight for nursing care funding on his behalf – and that he was still paying every single penny of his nursing care. End Nov 08: A PCT review panel looked at Dad’s case again. Dec 08: I received a letter to say that the NHS would refund his care fees from Jan 07 onwards. 19 Jan 09: I sent in my claim for £76,000 (care fees (£60,000) + compound interest @ 8% + costs). The costs included the costs of sale of my parents’ house plus other costs in connection with the NHS’s illegal decisions. 9 Feb 09: I received a letter from the NHS stating that they would not be reimbursing any costs. Department of Health guidelines clearly state that the NHS must return a person to the financial status they enjoyed before NHS errors occurred. Empty words. 5 Mar 09: I received a letter from the NHS offering to refund £61,000 – this was £15,000 less than Dad was owed. They asked me to sign and return a form with my agreement. I did not agree to their calculations. I said they could send the bulk of the refund, but that I would pursue the rest. Early Mar 09: I was still waiting for the refund. I did a TV interview to talk about the whole issue of illegal care fees. 23 Mar 09: I wrote to the NHS stating that I would be pursuing the money through legal channels. 16 Apr 09: I received a letter from a firm of solicitors acting on behalf of the NHS saying that they would be handling all communcations with me from that point onwards. (At what cost to the taxpayer?) The letter stated that my father had been adequately reimbursed. (I had still not actually received any refund at all for him.) It also said that I had not been forced to sell his home to pay for care. This was completely wrong! The letter also said they had decided to pay me £500 for any inconvenience. It was an insult – and I knew they were trying to get rid of me. May 09: I finally received a cheque for the lower amount of the refund for Dad. The NHS posted it to my father at the care home instead of to me. Dad was not physically capable of opening or reading his own post. The care home had a policy of not opening residents’ post, nor telling relatives what had arrived in the post. A carer put it in his fruit bowl and it was only by chance that I found it the next time I visited my father. What a ridiculous situation. 17 May 09: I wrote an angry letter back to the Finance Department at the NHS, listing an ongoing catalogue of errors in their procedures and in their communication. 18 August 09: I received a letter from the NHS solicitors stating that the cheque was in full and final settlement and defending their decision not to pay costs and to use a lower rate of interest. They suggested I think very carefully before taking any further action. A couple of weeks later my mother died. Six weeks after that my father died. In the shock and grief of the situation, I no longer had the energy to reply – something, perhaps, the NHS relies on. I have still not agreed that the refund was ‘full and final’ settlement, but I have decided to direct my energies into helping other families pursue the NHS care funding they are legally entitled to. It is, if you like, a way of forcing the NHS to pay up for other people. I consider my father’s case still open. Watch her TV interview about NHS Continuing Healthcare on our YouTube channel. Alternatively, read the interview transcript.